UFO SIGHTINGS DAILY: Mexican Musician Records "UFO fleet" On April 2016, Video, UFO Sighting News. Mexican Musician Records "UFO fleet" On April 2016, Video, UFO Sighting News. This group of UFOs probably felt they wanted to send the people on the ground a message...to show that they were friendly. 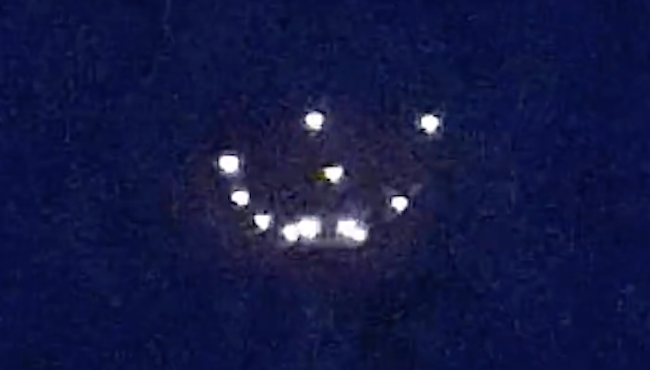 The UFOs actually formed a happy face for about 5-8 seconds, then broke formation. What is more universal than a smile? That is communication. Awesome catch, with a more awesome message. What this video uploaded to YouTube clearly depicts are unidentified flying objects. Therefore, the term "UFO fleet" fits perfectly. It was recorded in the skies over Tijuana, Mexico - an area that has drawn the attention of many experts of the UFO phenomenon, since in recent years, sighting reports have become incessant. The recording was made on the night of April 18, 2016 in Playas de Tijuana, Mexico, by corrido music artist Charly STPX, who after rehearsing with his band near the pier, became aware of some lights hanging in the air only meters over the sea. These images were shared on YouTube and over a dozen luminous objects can be seen, immediately leading them to believe it was a UFO fleet. The musician states this is the first time he's seen anything like it, as he has no knowledge of the UFO phenomenon. What caught the attention of hundreds of YouTube users (and of other social media outlets) is that the lights maintain a formation that resembles a "smiley face", causing many to say it was the "happiest UFO fleet in the galaxy." As can be heard on the video, Charly STPX hastens to explain that these are not "globos de Cantoya" (hot air balloons) which are popular in that region of Mexico. The YouTube video, which runs nearly 5 minutes, shows how the light formation descends and becomes lost in the horizon, which was still visible to eyewitnesses. Unfortunately, the cellphone camera was unable to capture some details described in teh video. The musicians knocked back a few beers to celebrate this close encounter of the first time.